Since their first appearance at Tokyo Idol Festival 2017, =LOVE has experienced a huge rise in popularity. Less than two years after the group’s debut, 4 singles and various performances abroad, time has finally come for =LOVE to celebrate with their fans, in a very first solo concert titled “Hajimemashite, =LOVE desu!” (Nice to meet you, we are =LOVE!). The event took place on February 16th, 2019 at the Memorial Hall of the Showa Women’s University in Tokyo. It was divided into two concerts during the afternoon, including a major announcement during the first performance! 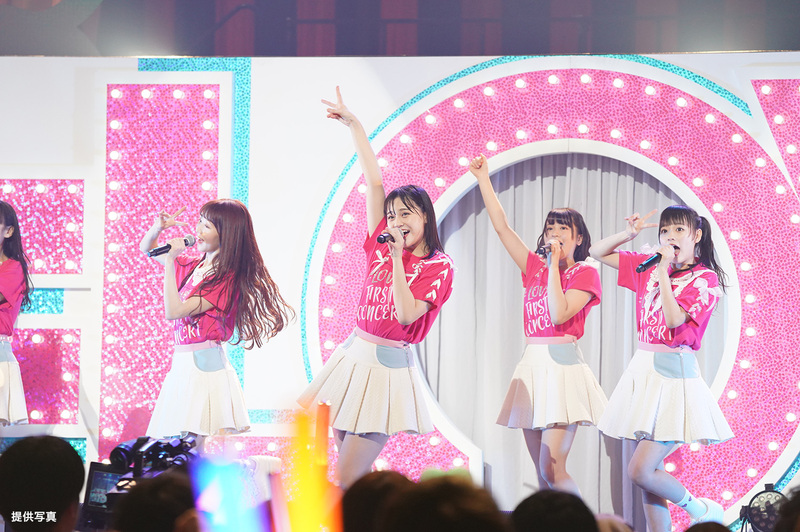 The group’s 5th single, named “Sagase Diamond Lily”, was announced, with a release scheduled for April 24th. With these very good news in mind, we had the privilege to attend the second performance of the day. Sashihara Rino was of course present to watch over her protégées, accompanied by her friend and AKB48 comrade, Minegishi Minami. A video started on the giant screen above the stage, in which excerpts from members’ interviews, mixed with behind the scenes and dance training footage. They mentioned how the group had become their family and a safe place to evolve in and be able to give their best, despite the difficulties of the beginning. The end of the video followed with an instrumental track, warming up the audience … when the sound of the first notes of “=LOVE”, the group’s first single, suddenly blasted through the air. Dressed in cerulean outfits with white touches (designed by the girls themselves), the members were as determined as the fans to give everything they had! We could hear fan calls of an incredible and rare intensity, and it was clear to us that “=LOVE” was definitely the best song to start with. “Bukatsu-chuu and Me Ga Au Natte Omottetanda” and “Youkoso! Ikorabu Numa” then followed. During the festive atmosphere of the latter, two large carts were used to carry Takamatsu Hitomi and Saitou Nagisa throughout the alleys, seeing the fans delighted to watch them perform from up close. “Kiara, Tasuke ni Kitazo” and the young Saito Kiara standing in the center position closed the first part of this concert before a short break. Sashihara Rino‘s first solo single “Soredemo Suki Dayo” resonated in the venue, with behind the mic, Saito Nagisa’s adorable face! The outfit she wore was even far more extravagant than the original dress, as this one featured excessive pink ruffles, which fit perfectly Nagisa’s overwhelming idol aura, as a pink ocean lit up the entire concert hall. Noguchi Iori and Sasaki Maika started with “Futari Saison”, honoring one of Keyakizaka46’s iconic tracks. The charmpoint of the performance was the duality between the two personalities of Iori, quite an intense and serious character, and the charming Maika in Hirate Yurina’s role. The duet’s scenic power has conquered the audience unanimously. Nogizaka46’s “Kizuitara Kataomoi” by Saitou Kiara, Satake Nonno and Otani Emiri followed next and the irresistible charm of this trio was a perfect match for the refined melody of this legendary title. It was Hana, Anna, Sana, Shoko, Hitomi and Risa‘s turn to perform “Kono Koi wa Transit” from Someday Somewhere (one of the subgroups from the Last Idol Family, also produced by Sashihara Rino). The show then kept going on full force with Keyakizaka46’s “Fukyouwaon”, Hitomi as standing in the center and Sana showcasing her amazing vocals. After a short MC, Hitomi, left alone on stage, told the story of the group’s debut, from their auditions to the very important day of their first appearance at the Tokyo Idol Festival 2017, which they ‘will never forget’. Sequences from the same era were shown, including their preparation for the festival backstage, until the moment they walked up the stairs towards their debut performance. Dressed in their original outfits, all the members performed four songs ; “Iiwake Maybe” (AKB48), “Melon Juice” (HKT48) (introduced by Risa, former member HKT48) “Girls Rules” (Nogizaka46) and “Oogoe Diamond” (AKB48). This is the same setlist they performed at the Tokyo Idol Festival two years ago, with a video of the said performance running in the background. These strong symbols proved that this summer day will remain engraved in the heart of each member. During the following MC, they mentioned that Risa had Sashihara’s position in Melon Juice, while Risa, Emiri, Kiara, Nonno and Shoko experienced their own version of “Boku wa Yada!” inspired by Hirate Yurina, which didn’t fail to make the fans laugh. Kiara warmed the atmosphere with her famous “Kikushi” and then launched the rest of the show. “Kyoku no Doko ka de” were led from the beginning by the group’s two most powerful voices: Iori and Sana. They then continued with “Teokure caution” when a VTR surprised everyone… the giant screen showed a compilation of romantic rendezvous featuring Nagisa, as she was constantly interrupted while trying to declare her love, whether by a lost foreigner asking the way or by the clumsiness of a waiter in a restaurant. The gags contributed to the general hilarity that subsided when the whole group came back on stage wearing brand new outfits, and performed “Todoite LOVE YOU”, “Bokura no Seifuku Christmas” and “Want You ! Want You !”. Despite more than one hour and a half of an intense performance, the members came back on stage and pursued with a second explosive interpretation of “=LOVE”. Confettis spread throughout the air while fan chants were getting louder and louder, closing the main setlist on an excited note. We didn’t wait for the encore very long, as =LOVE went through “Ima, Kono Fune ni Nore!” and “Aikatsu Happy End”, while the members ran even as far as the second floor of the hall in order to meet all the fans. In addition to a fifth single already announced a few hours earlier, the group received a double gift with the announcement of their first national tour in April, titled “Ima, Kono Fune ni Nore”, taking them to explore the cities of Nagoya, Osaka and Tokyo! These gifts are a sign of trust from their producer Sashihara Rino. Sasshi acknowledges that her little seedlings have the desire, the passion, the talent and the means to bloom into beautiful flowers, their fans being there to make sure they have their place in the sun. Already so many achievements and yet =LOVE’s adventure has only begun, as the name of the very last song of the evening proved it: “Start!”. 18. Want you ! Want you ! EN01. Ima, Kono Fune ni Nore!